The trip from San Bartolomé lasted from six-thirty in the morning to about four in the afternoon. With a loaded backpack on my back, a loaded backpack on my front, and an overflowing costal with dangling shoes, I took two crammed camionetas to Antigua. Every few steps I could hear the tiny sound of backpack stitches breaking; the pack I so proudly haggled down to half price in the market was giving me my money’s worth. In Antigua I caught a three-wheeled taxi (called a tuk-tuk, after the sputtering go-kart noise they make) to the central square. The door on my side popped open en route and the backpack with my computer tipped over and threatened to roll across the cobblestones at speed. But I arrived with my pieces and I caught a microbus with 5 other volunteers and a few European and North American tourists bound for Cobán. We spent a little extra for this mode of transport, but it was worth it. Not only did we get a twenty minute stop at the Monja Blanca truck stop (instead of the typical ten offered by the larger line), but we enjoyed modest spheres of personal space that are virtually nonexistent on any form of conveyance in Guatemala. We all parted ways in Cobán. My friends from Cooperativa Samac met me in the municipal square, relieved me of my various burdens and ushered me to the waiting microbus. It’s only a thirty-minute ride from the center of Cobán to the Samac cooperative. But the changes out the window are dramatic. In my three months of training, I hoped that I’d be sent somewhere distant and dissimilar from San Bartolomé. Peace Corps granted my wish. But travel to the cooperatives of Samac and Sanimtacá is not so much a great span of distance, as much as a passage through time. The cellular phones and snack wrappers give away the era- or maybe just confuse it. I see a girl in traditional huipil and corte hauling water in a plastic two liter soda bottle and I can’t decide which part is anachronistic. The fact that this indigenous girl needs to haul water at all confirms my suspicion that the plastic bottle and I are intruding before our times. The road is rocky and unpaved. Fields of coffee, cardamom, sugar cane, and bananas open on either side, punctuated by rugged outcrops and little houses of wood. The few other villages on the way to our destination are cooperatives as well. Many of the communities surrounding Cobán were German plantations at the turn of the century-before-last. The Germans grew and processed coffee, cardamom, and tea, employing Guatemalans in their fincas and factories. During World War II, the Guatemalan government evicted the region’s Germans under pressure from the U.S. government. The infrastructure of the original plantations and communities was mostly abandoned and forgotten, but the fertile fields and crops were absorbed and divided among the local people. 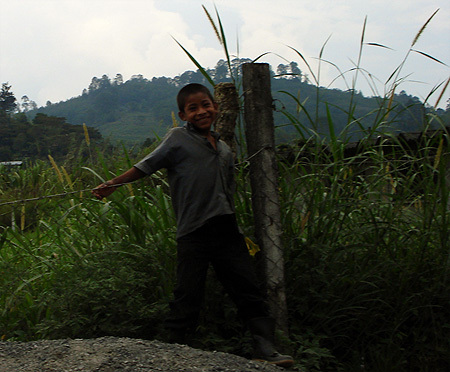 Independent agricultural communities of native Guatemalans took (or more accurately, resumed) root in the lands around Cobán. Samac and Sanimtacá are among the local communities that now benefit from the German introduction of coffee and cardamom. But despite the considerable European influence in the region and in the country as a whole, this area has retained an impressive hold on its indigenous roots. The most obvious manifestation is my first great challenge. Because I spent three months in Spanish classes and immersion. I attained a level somewhere between conversational and survival sufficiency. I can request a meal, but I probably can’t debate the ethics of eating it. Now I arrive in Samac and Sanimtacá where the Spanish is not much better than mine. Most of the men speak some Spanish, but everyone speaks Q’ekchí; one of more than twenty Mayan languages still living in Guatemala. I don’t speak Q’ekchí. In fact, it took me a pretty long time to prounounce “Q’ekchí” (the ‘Q” is a throat click). My life here is as different from life in San Bartolomé as life in San Bartolomé was from life in Virginia. I’m back in language square one; pointing at things and nodding. I find myself as relieved to hear Spanish as I was relieved to hear English when I was in training. My quarter-century of advantages has me at a slight disadvantage as I adjust to living in this remote, rural community. For example, my lifelong reliance on dining utensils is an undisputed handicap at many of these tables. In all memory, potable water at a variety of temperatures was available at the turn of a handle. Here, the water runs inconsistently, sometimes a trickle, sometimes not at all, but when it runs, it’s always at one temperature. I started to think that a hot shower was a luxury out of reach. But Don Galindo told me that he’s had a hot shower before and he didn’t like it. So it’s actually just a matter of preference- getting a hot shower is harder than coming to appreciate and enjoy a cold one. And suddenly I’m washing my laundry by hand in a pila (a concrete sink) and hanging it in the sun. The latrine has a view of full sky and the side of a building two meters away. When it rains, sheep take shelter under the eaves and complain through the gaps in my walls. One morning the joints of my left hand were swollen and itchy. I asked my friend Ernesto if it was due to mosquitos. I almost never walked around San Bartolomé after dark. I don’t think San Bartolomé was unsafe (there were only two or three homicides that I know of during the time I was there, and although not justified, they were all related to retribution or street justice), but there was an implicit atmosphere of suspicion and an abundance of security measures. But things are simpler here. Everyone is more open. There’s not a strand of barbed wire in either cooperative. The generosity of the people is incredible and they have welcomed me without reservation. 2. It’s rude not to accept whatever you’re offered, including water. 3. Cover your knees. Long pants and skirts only. Gender appriopriate, obviously. 4. Never speak to anyone while wearing sunglasses. They want to see your eyes. 5. On the road, you stop to speak with anyone you know, even just to say what a pretty day it is. 7. All visitors get at least a hot drink, food if you have it. 9. When entering a room or joining a gathering, you must acknowledge everyone individually, even if there are 15 people present. 10. Everything you’re served is “Sa us us” (Tasty double-good), even if it’s pacaya, a bitter, fingery tree part. 11. Handshakes between men, women get an arm touch. 12. “B’anyox” is thank you (pronounced ‘Bantiosh’). Wear it out. These are the rules I adhere to. I hope that I’m acting appropriately at all times, but I’m just a baby here, there’s no way for me to know when I’ve made a small mistake. But as far as cultural exchange, we don’t meet in the middle; it’s my job to reach across the aisle. In fact, sometimes the people here can be (from my cultural perspective) unconsciously rude. They often ask my age and whether I “have a woman” as opening conversation. If I have any item in my possession, invariably they ask what it cost. All of my polite requests for a latrine door have gone unaddressed. Even though they know that I don’t speak Q’ekchí, they will often have long excluding conversations in front of me, or worse, they invite me to a work meeting and discuss matters in Q’ekchí for two hours while I wait for someone to remember I’m there and lean in with a summary. Their flexibility with time can be especially frustrating. Nothing ever begins or ends on time, so I’ve gotten in the habit of carrying a book around with me whenever there’s something we’re supposed to do. But when I have something to do on my own, their time flexibility leaks into my schedule. The other day I was planning a trip to Cobán for supplies. I had my backpack on, the bus was waiting. Just as I was about to board, my friend Alfredo appeared to invite me to his house. “There will be a bus later.” He assured me, as if I truly didn’t know it. So I went to have coffee at Alfredo’s house and caught a bus to Cobán two hours later. Alfredo was right, of course. There were other buses. My North American impulse to ‘get things done while in a position to do them’ would have been as impolite to him as his ‘interruption of laid plans’ was to me. It’s my responsibility to respect the local norms. But none of these minor frustrations are a surprise. As a matter of fact, they come right out of the culture textbook. Adjusting my patience will be faster and easier than trying to adjust local mentalities to suit myself. I’m not prepared to complain anyhow. It’s only been two weeks, and there’s no one to bail me out. I have to work through whatever I come up against. Social inconveniences are trivial. I have work to do. My assignment is to help develop sustainable income-generation projects in both Samac and Sanimtacá using the natural resources and attractions that they already have. Although much of their land is devoted to coffee and cardamom, both communities had the foresight to set aside significant amounts of forest as untouched reserve. This is remarkable considering that forest generates no immediate income to anyone, and converting all available land into coffee fields would have been extremely lucrative in a very short time. But the people are organized and concerned about the future. For this, I’m filled with respect for them. So I’ll do my best to support and assist them with their ideas as the most I can do to encourage and reward their wise management. 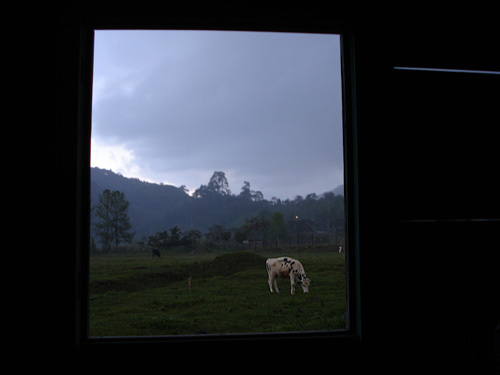 But when I wake up in the morning and swing the wooden window open, I can see the mountains through the mist. The cows are flicking the wet from their ears, and in the distance, tiny figures in traditional Maya dress are shuffling down the paths through the long grass. Baskets of cloth-wrapped vegetables ride above their heads, as they have for centuries. And it’s clear that I will never quite fit in here. That’s good. In fact, what if I’m nervous to start work? What if I’m scared I might change something? 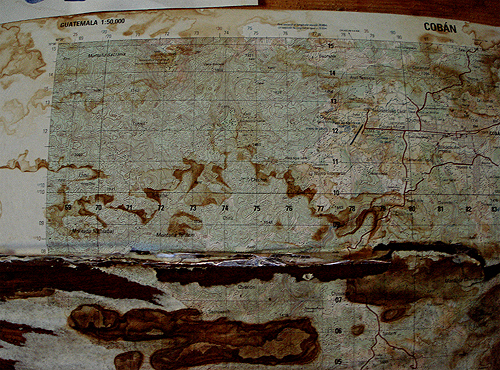 your blog is almost making me want to do the peace corps. sounds crazy and lovely and full of tiny triumphs. did you get a second letter from me? hope so! Andrew: just wanted to let you know that I am checking your blog regularly for updates and was very, very excited to see an entry that went on and on, requiring much use of the scroll function on my mouse. The pictures are beautiful, and I continue to be fascinated by the way that you are interpreting all the cultural and other differences that you are coming across. Keep writing, keep sharing your thoughts, please. Taylor and I just got back from Austin. The city is awesome, and Taylor remarked that it seemed to be the kind of city you would enjoy, which brought us some comfort. All the breakfast taco stands reminded me of my brief time in central America, which of course made me happy. Still no decision on law school, though. Take care, and give muchos abrazos a su gente de Sumac.